TWO LOBSTERMEN IN the US state of Maine should probably think about buying some lotto tickets after they caught a pair of rare albino lobsters within a week. The Portland Press Herald reports that Bret Philbrick caught the curious crustacean off Owls Head in Maine on Thursday and Joe Bates caught one off the Rockland breakwater days earlier. Albino lobsters are believed to be about one in 100 million. The lobsters are in a crate at Owls Head Lobster Company. One will go to the Maine State Aquarium in Boothbay Harbor and the other to Brooks Trap Mill in Thomaston. The lobsters are under legal size and would normally have to be returned to the ocean but the Marine Patrol made an exception in this case. Bates also caught a one-in-30 million yellow lobster on Monday. 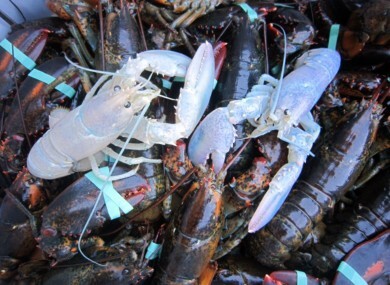 Email “Two exceptionally rare albino lobsters caught in one week in Maine”. Feedback on “Two exceptionally rare albino lobsters caught in one week in Maine”.